Has Dr. Christine Blasey Ford written over 65 peer-reviewed articles? You are a professor affiliated with both Stanford University and Palo Alto University. You have published over 65 peer-reviewed articles and have received numerous awards for your work and research. Why doesn't Google Scholar reveal more articles by Dr. Christine Blasey Ford? Yes! In fact, in the front matter for a recent article, she was listed as having 81 publications. Most of Dr. Christine Blasey Ford's articles are under the name Christine Blasey. That's why they weren't showing up in the Google Scholar search. Christine Blasey is a Professor of Psychology at Palo Alto University and a Research Psychologist at Stanford University School of Medicine Department of Psychiatry and Behavioral Sciences. Christine received a Ph.D. in Psychology from the University of Southern California and an M.S. in Epidemiology from Stanford University. Christine provides statistical consultation in academic settings (e.g., Departments of Psychiatry, Cardiovascular Medicine, Education) and in the private sector for pharmaceutical companies testing new medicines and medical devices. Christine's consultation area of expertise is the interaction between pharmaceutical companies and the United States Food and Drug Administration (FDA). She has co-authored over fifty peer-reviewed journal articles and book chapters and serves as a statistical reviewer for several psychology and psychiatry journals. Christine teaches statistics, research methods, and psychometrics in the PGSP-Stanford University Consortium for Clinical Psychology. Her primary interest is mentoring future psychologists. In addition, one work which was not associated with Dr. Helena Chmura Kraemer is "Mifepristone versus Placebo in the Treatment of Psychosis in Patients with Psychotic Major Depression", a 2006 article in the journal Biological Psychiatry. 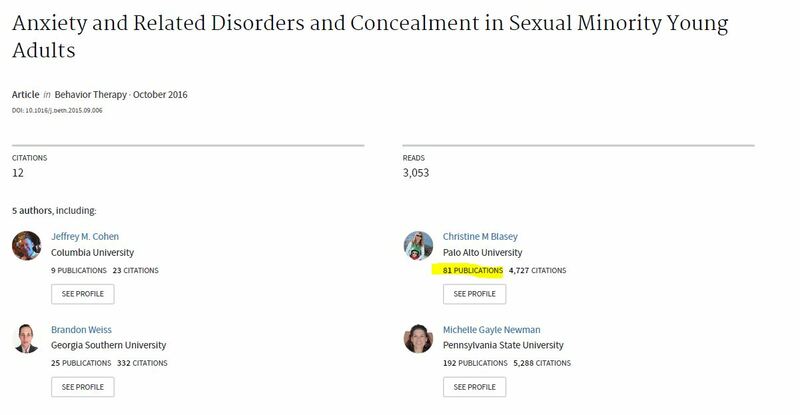 Christine Blasey is listed as a co-author with affiliations with Corcept Therapeutics, Menlo Park, California and also the Department of Psychiatry, Stanford University, Stanford, California. Sexual minorities face greater exposure to discrimination and rejection than heterosexuals. Given these threats, sexual minorities may engage in sexual orientation concealment in order to avoid danger. This social stigma and minority stress places sexual minorities at risk for anxiety and related disorders. ...worries related to discrimination, such as loss of employment due to sexual orientation, may at first appear to be a cognitive distortion, but in fact it is possible to be legally fired for being gay in most of the 50 states (Human Rights Campaign, 2015). Was the SCOTUS the last thing on Dr. Christine Blasey Ford's mind when she made her allegations during therapy in 2012?